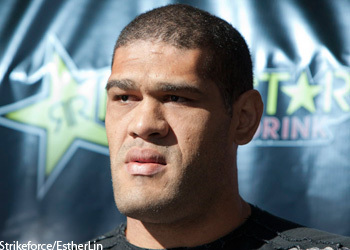 After their instant classic on Saturday at UFC Fight Night 33, it was a given Antonio “Bigfoot” Silva (pictured) and Mark Hunt would score an extra $50,000 apiece for “Fight of the Night” honors. However, UFC president Dana White took the financial incentives a step further by awarding each heavyweight their win bonuses despite the fact their scrap resulted in a majority draw. Hunt made $160,000 in his knockout loss to Junior dos Santos in his last outing. He would have doubled that total with a victory, so he pocketed at least that amount thanks to White’s generosity. Silva, meanwhile, earned $75,000 for getting TKO’d by reigning heavyweight champ Cain Velasquez at UFC 160. Therefore, the Brazilian will take home at least that tally courtesy of White. Obviously, both will also be paid their show money on top of their win bonuses. UFC Fight Night 33 took place inside Brisbane Entertainment Centre in Australia.